Okay, I'm a day late to the party but I was enjoying two friends' wedding on Saturday proper. So, tonight, now that I'm home and laundry is in for tomorrow, I figured I'd link up Joanne at Head Over Hells for Teaching for my first Spark Student Motivation of this school year! Today, I'm sharing a writing idea to get the creative juices flowing in the classroom! My teaching partner, once again, had a fabulous writing activity from her summer classes with the Ohio Writing Project. One idea was to encourage writing through a class symphony poem. 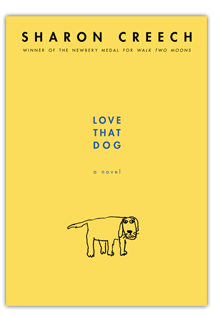 In class, we're been reading Love that Dog by Sharon Creech. In the novel, Jack, the main character is very reluctant to write poetry and claims that "only girls do it." Throughout the book, Jack beings lifting lines from famous poets he loves to start to tell his story through various poems. I connected the book to our class poem by having students lift lines they love from favorite songs. We talk about how lines we love can have a deeper meaning to our lives or just make us feel good. Students each took a sentence strip and added their favorite lines to a strip. Then I had a few helpers, help me arrange our lines into a poem. I know a fellow colleague had students working in partners to choose lines that could "fit" together to help write her class poem. I hung up our entire poem outside our classroom door. We wrapped up Love that Dog last week. I know some of my new poetry lessons helped foster a sense of writing and creativity as one of my most honest students left on Friday telling me, "Now I love poetry. I just want to write it all the time. I even spent some time at recess writing a poem! I'm going to write them all year!" What are you doing to motivate writing in your class rooms? This blog discussing here very important topic such as what to do to motivate writing in class rooms? And I want to share this motivating post with my fellow writer so they can also encourage their students in classroom for bright future at our consultancy where I am currently working. Being as an essay writer and top quality essay writing service London UK provider at Essay Writer UK, I think Writing takings assurance, self-discipline, and wish. So don’t be hurting and find a comfortable place where you can write away oblivious to the household duties which are being disused. Very unique post on spark student motivation and class symphony poems which has so much to tell us about how to work with students in classroom & how to motivate them. Professionally I am an assignment writer & working with experienced human resource assignment writers - http://www.assignmenthelpfolks.com/human-resource/ at Assignment Help Folks and providing world’s best academic writing services to many students who are coming to take assignment writing services on different subject such as nursing, marketing, business, statistics, English, philosophy etc. And being as an academic writer, I always take inspiration from such kind of blogs. I entirely enjoyed reading this post. Looking forward to more such kind of post. Spark Student Motivation: Book "Previews"
Workshop Wednesday: Organizing it All!